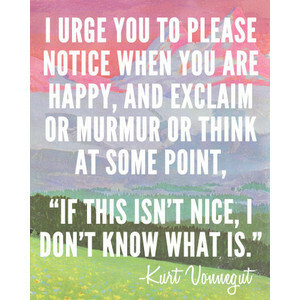 I added a new page to the blog, one which will house my Kurt Vonnegut Reading Challenge. It’s something I have pledged to do because he is my favorite author, and because, why not? Well, and also because I’m very excited that the documentary about his life will be released, thanks to the success of the Kickstarter campaign. It’s been at least 20 years since I’ve read most of his books, so I have decided to read them all again, in chronological order. I’ve already begun Player Piano, Vonnegut’s first novel. It’s rough going, but it’s also contemporary enough that it’s hard to believe that it’s over 60 years old. Anyway, review will be coming soon. In the meantime, if you feel like joining in, please leave a comment either on this post or on the page.